Got these boots today- a few days early! Got these boots today- a few days early! I think they are legit, authentic Forma Adventure Low boots as stated by the ebay seller. They look identical to the brown Forma Adventure (high) boots I have (from Motostorm in Italy). Let me know if you have any questions, but I think these are the real deal. Thanks again to the OP, ScottKY. Now I have a lower but sturdy, waterproof CE boot to wear in warmer weather. 1st picture is the new grey low Forma boots. 2nd and 3rd pictures are the new grey Forma low on the left, and my brown Forma high on the right. Could you measure your foot and let me know what size you purchased? Does your toe touch the end of the boot? Wow, Scott. I ordered mine from your tip and they were on my porch when I got home just a little while ago. Shipping is just a roll of the dice sometimes, especially with the winter we're still having. I can tell you the boots will be worth the wait. They look great and feel fine. Hmm. Well, they came out of Henderson, NV, so I guess it makes sense that they’d get to WA sooner. But I’m glad you like them. I’m definitely looking forward to getting mine. My feet do NOT touch the end of the boot. You don't want them to; that's why you add the .75 inch to your foot measurement- to give your toes room, like you would in any shoe. Plus, from what I read from people who have spent much more time on a bike than I have, your feet will swell as the day goes on, so you definitely want to leave yourself that .75 inch buffer. 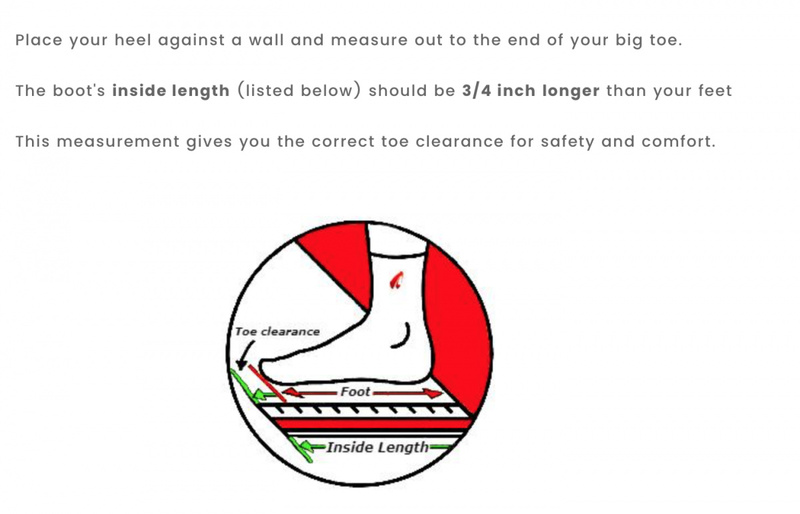 Your math is correct; according to what your foot measured (11 3/4"), and the size chart, adding 3/4" to that = 12.50, which means you should get a size 15 (which I see that ebay seller doesn't have). If he was taking returns on that boot, you could try a size 14, but a 14 will probably be too small on you. Keep in mind the socks you'll be wearing, too. I wear merino wool, on the thicker side, so... I need that 3/4" of space. One suggestion is order a size 15 from Revzilla or another place that would take a return, so that you can see which size fits you best. Then, keep your eye peeled on that ebay seller's site for boots in your size. I checked his site- there are a LOT of motorcycle boots for sale. boots came, they seem to fit well. thanks ScottKY. My foot measures 10-3/4"; +3/4" = 11-1/2. I bought 45's. On Forma's chart 44/10 is 11.4" and 45/11 is 11.8". If I had looked at that, I'm not sure what I would have done, but I didn't. I already own Forma Terra's in a 45. I love them and they fit great. I just don't always want to wear such a substantial boot. These Adventures are a lighter duty type boot than the Terra. But I think they'll be great for a lot of my riding. Well dang...seems everyone has gotten their boots except me. Ironic. My delivery is now scheduled for Friday. Not sure what the holdup is. Gotta agree that's pretty ironic, ScottKY. Just do not expect them that day, and that's when they'll arrive.